These posters are printed 'on-demand' in-house at BHI on our high-quality, seven-color, photographic large format printer. They are exhibit quality, not halftoned, mass-produced posters. 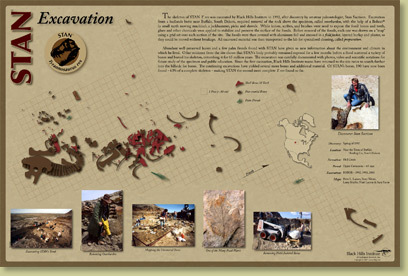 BHI also licenses the poster's individual photos and illustrations as electronic files for inclusion in your custom STAN T. rex exhibit compositions. 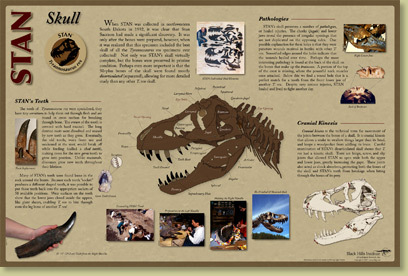 Alternatively, the posters' content can be adjusted to fit your STAN T. rex exhibit by BHI (fees applicable). Contact our media department for more details. Notes While these posters are meant to accompany a STAN Skeleton exhibit, they will work equally well when used in exhibits of other STAN material. 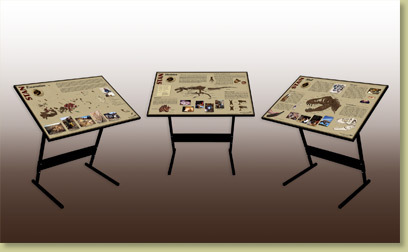 Extras Save $125 with this purchase of all framed posters and stands. The three posters are also available separately. Additional packing fees may apply. Please contact us with your questions. 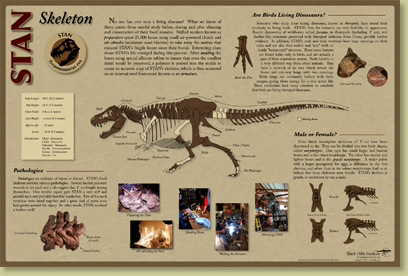 Complete STAN T. rex display posters and stands.